This ranking is based on the Global Talent Competitiveness Index, an annual report created by INSEAD in partnership with the Adecco Group and Tata Communications. It aims to give governments and businesses the distilled data from 125 countries needed to inform their talent policy and strategy decisions. Talent competitiveness refers to the set of policies and practices that enable a country (or a city) to develop, attract and empower the human capital that contributes to productivity and prosperity. As global mobility tends to increase, talented individuals focus less on which country they want to go to and more on which city they want to live in. And cities are increasingly defining their own methods and strategies to attract, retain and develop talent. In this year’s report, we compiled an index of the Global City Talent Competitiveness Index (GCTCI) for the third year. In addition to the central variables used to rank talent competitiveness at the country level, we include a specific measure that encompasses a city’s global aspect for the purpose of the GCTCI. The GCTCI continues to expand and now includes 114 cities, up from 90 last year. This year we made a concerted effort to increase the numbers of cities outside Europe. The 2019 index has more cities from outside Europe – 63 from around the world – than from within. The top 20 cities stretch across three continents, including five American, four Asian and eleven European cities. Our methodology for determining the ranking of cities encompasses overarching variables associated with talent. For a complete description of the data and variables used, see the report. To gauge how well cities enable their talent, we take into account aspects of preparing the ground, as it were, examining R&D expenditure, households with internet access and the presence of Forbes Global 2000 companies, for example. To attract talent, we consider each city’s GDP per capita, quality of life and environmental quality. To evaluate how a city grows talent, we look at the presence of major universities, the percentage of college enrolment and individuals in social networks. To establish how well a city can retain talent, we consider personal safety, a high concentration of doctors and the affordability of housing. We track how global a particular city is through how much of its workforce has tertiary education, its airport connectivity and the presence of international global organisations. All of these dimensions need to be combined to create a talent competitive environment. However, priorities vary between cities. As a feature of the 2019 report, our partner Adecco has created a Talent Positioning System to help people find out which country or city is the best match for the talent variables that are most important to them. Companies cannot create quality of life or security – this is something only cities can do. The top of our rankings is made up of cities with a growing footprint in attracting global talent and building reputation. Metropolises (cities with more than a million inhabitants) have “natural” and often historical advantages. Large industries are often drawn to large cities – like finance in the City of London (14) or Silicon Valley near San Francisco (12). Important universities are historically central to large cities such as Boston (6) or Zurich (5). Mid-sized cities, with a few hundred thousand citizens, can have an agility and a culture of innovation. The dynamism displayed by emerging cities, like Dublin, Ireland (35) or Bilbao, Spain (44) rivals the advantages of established hubs through the creation of active cultural scenes. As talented individuals can work from anywhere, physical and technical connectivity and quality of life are competitive advantages for smaller cities. For the first time in the GCTCI, an Asian city – Seoul (10) – is in the top 10. Out of the 29 cities ranked in Asia Pacific, 11 are from mainland China. The rise of Asian cities on the global talent radar screen is bound to continue in the coming years, aligned with greater national efforts to develop smart cities. The top four Asian cities in the GCTCI are home to large organisations and focus on retaining their talent. Seoul, the top global city in terms of enabling talent, has created an innovation bureau to engage citizens in the design of public policies. Policymakers are vital in creating talent-friendly environments and this Korean city is focusing on quality of life, a priority for many international talents. A lure for foreign investment, Taipei (15) was chosen for an Amazon Web Services innovation centre last year. AWS is prominent in the start-up community in Taiwan, which considers the platform as the basis for software development. 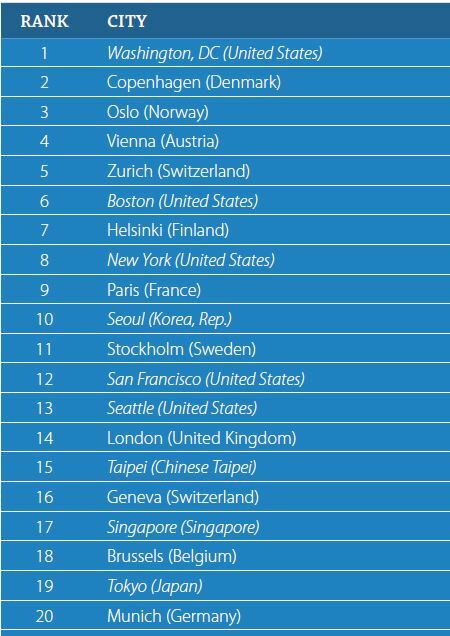 As a country, Singapore (17) always ranks in the top 3, but when compared with other global cities, we have a slightly different result. After all, cities benefit from key advantages over nation-states when competing for talent: Economic growth rates may be significantly higher than the average national growth; there are specific advantages related to geography, culture or quality of life; and cities have a higher degree of agility and branding abilities. Even compared with top global cities, Singapore’s excellent education system boosts its talent growth. It is also considered one of the safest cities in the world. The Japanese capital Tokyo (19) has a large number of Forbes Global 2000 companies in its urban area and is a draw for talent. As in Singapore, its excellent personal safety ranking helps it retain talent. Entrepreneurial talent, the theme of this year’s Global Talent Competitiveness Index, is critical to urban talent strategies, as smaller firms are generally more mobile than larger companies. Municipal strategies are developed around the creation of incubators like Station F in Paris (9) or the newly created Hub71 in Abu Dhabi (55). Other cities, like Seoul, offer “innovation zones” that directly target fledgling entrepreneurs. To thrive, smart cities need to apply entrepreneurial talent to everyday problems, such as waste management in Copenhagen (2) and Lisbon (45). Copenhagen only sends around 2 percent of its waste to landfills. Concern about possible air pollution in the late 1980s led to regulations that encourage waste to energy and recycling programmes. In the GCTCI, we have found that there is a positive feedback loop in action amongst the variables. The highest correlations are between enabling and growing talent and between the attracting talent and the global variable. The relationship between these talent variables can lead to a virtuous cycle for cities. For example, high income levels lead to a larger number of homes with internet access, which means better education and healthcare access which leads to an attractive environment which pulls in more higher paying jobs. When cities perform well in one talent variable, they are likely to perform well in others. Just like good performance spreads across talent variables, there is a natural link between top countries and their cities too. This is not surprising given that cities generally share their nation’s social, political and economic environment. For example, Korea, at 30 in the global ranking, performs especially well when it comes to enabling talent – as does Seoul. Each city has strengths to build on for greater talent competitiveness. Bangalore (89), for example, is one of the top global cities in terms of retaining talent. As policymakers recognise their cities’ strengths and further enhance them, those cities will grow. The GCTCI shows how cities continue to play a role in shaping talent policies and strategies, as well as in adopting imaginative ways in which talent can be grown, attracted and retained locally. This year’s Asia launch of the Global Talent Competitiveness Index is held Tuesday, 23 April in Singapore. The GTCI 2020 will be about “Global Talent in the Age of Artificial Intelligence”. Some of the questions it will explore are: What will the role of vocational training and lifelong learning be in the workforce of the future? Which companies, countries or cities are best positioned to benefit from the AI revolution? What kind of talents will be required to address some of the critical questions that surround AI, be they of a legal, regulatory or ethical nature? Bruno Lanvin is the Executive Director for Global Indices at INSEAD. San Francisco is not in Silicon Valley. It's in San Jose, 10th largest city in the country.